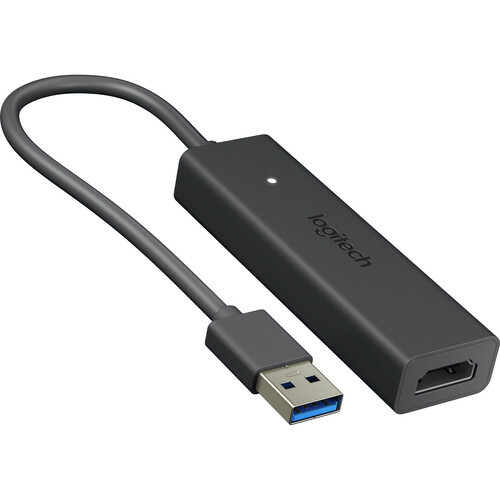 The USB Type-A to HDMI Screen Share Graphic Adapter from Logitech is designed to help you extend your display with its built-in HDMI 1.4a port and male USB 3.1 Gen 1 Type-A connector. With this interface, the Screen Share Graphic Adapter supports video up to 1920 x 1080 at 60 fps and audio up to 48 KHz, and can even transfer data up to 5 Gb/s. Furthermore, the Logitech Screen Share Graphic Adapter is designed to work with most content sharing programs, including Zoom, Skype for Business, WebEx, BlueJeans, and more. Additionally, the Screen Share Graphic Adapter is compatible with Windows and Mac operating systems. Logitech includes a hook and loop fastener, as well as a cable management mount, so you can place your adapter in a desired area. The Logitech Screen Share Graphic Adapter features a plug-and-play design. No software or drivers needed. Logitech's Screen Share works with Zoom, Skype for Business, WebEx, BlueJeans, and other meeting services that support content sharing. Packed with video encoding technology, the Screen Share Graphic Adapter is designed to be compact and connects to a conference room computer via USB Type-A. It also has an HDMI input for instant content sharing. Connect to Logitech Screen Share to project your presentations, spreadsheets, documents, and videos on an in-room display. For devices without a built-in HDMI port, the Logitech Screen Share can connect to a suitable adapter. This lets you share from compatible devices with a video output, including smartphones, tablets, ultrabooks, digital cameras, and media players. Share a preview of your video projects with the Logitech Screen Share, which supports HD video and audio over HDMI. The Logitech Screen Share is built with a low-latency HDMI connection and on-board video processing, which is designed to deliver a sharp and responsive experience. This contributes to a natural-feeling navigation, instantaneous typing, smooth scrolling, and 1080p HD video at up to 30 frames per second. Box Dimensions (LxWxH) 7.5 x 7.0 x 2.0"